A barbershop may not be the first place you would think to house a health care center, but Aaron Perry believes it’s the perfect place because it can bridge the deep-rooted gulf between the health care system and the black community. Perry, a former UW–Madison police officer who is living with diabetes, has spent years unraveling the complex relationship between black men and the world-class health care system in Dane County. 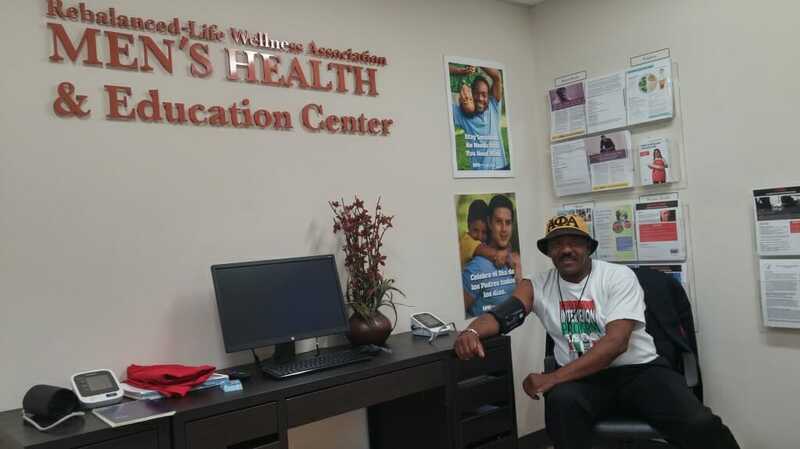 He founded the non-profit Rebalanced-Life Wellness Association in 2007 to help other black men with diabetes and reduce health disparities in his community. His breakthrough came as he was getting a haircut at JP Hair Design in Madison and listening to the clientele and barbers talk about health. He realized that, instead of trying to draw black men into the health care system – a process which so far had proven largely unsuccessful – the health care system should be brought to meet black men in a place they trust and where they feel loved and respected. The trouble was, he said, the men would talk about their health challenges – like having gout, feeling faint or having heart palpitations – but would leave the shop with these concerns unresolved. Two years ago, with funding from SSM Health and support from barbershop owner Jeff “JP” Patterson, Perry knocked down the back wall of JP Hair Design and built the Men’s Health and Education Center. Patterson liked the idea immediately when Perry pitched it to him over breakfast and says the reason it works comes down to the strong relationships between barbers and clientele. Although the 120 square foot room is small, the space is utilized to its full potential. One wall is lined with pamphlets on cancer, heart disease, high blood pressure, influenza, pneumonia, diabetes, and many other ailments. Above two computers preloaded with Harvard Medical School and the Mayo Clinic information is an eye test. Clientele can also have their body mass index calculated and their blood pressure checked. In April, 84 men had their blood pressure screened – 68 percent had high blood pressure. The center also offers referrals for mental health concerns and substance abuse – although Perry hopes to one day be able to offer these services under the roof of the barbershop – and brings in health care professionals, like a dental hygienist who does free oral screenings. They’ve learned that a large number of men struggle with mouth and tooth pain but grit through it. Some live with pain for years. Dewayne Conklin came into the center in early May with high blood pressure and significant pain in the back of his jaw. Perry, using partnerships with Madison Public Health Dane County, got him an appointment at Access Community Health within four days. Doctors learned he had been enduring the pain from two decaying teeth for four and a half years. After the two teeth were removed, Perry said Conklin was practically doing backflips he was so happy and relieved. Perry was recently awarded a Community Collaboration grant from the Wisconsin Partnership Program at the UW School of Medicine and Public Health to expand his efforts reducing health disparities among black men and boys in Dane County. Perry will use the $300,000 in funding over a four-year period to start the Black Men’s Wellness Sustainable Initiative. The grant, designed in response to feedback from nonprofit organizations across the state who sought more involvement from UW, also provides training and support from the university. “What we heard loud and clear was that in addition to funding, organizations want to build their capacity to be more effective in their communities – and that the resources of the university can support that,” said Courtney Saxler, program officer for the Wisconsin Partnership Program. The grants focus on health equity and are community-driven. Saxler said Perry fit the bill perfectly. 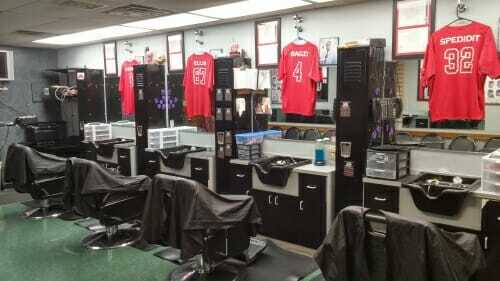 With the new funding, Perry said the center can now roll out what the men in the barbershop have been requesting. He is most excited about the establishment of the Barbershop Health Advisory Committee, a collaboration between all eight black barbershops in Dane County. Of the 15,600 black men in Dane County, these barbershops have the potential of reaching upwards of 5,700 of them, he said. The committee will meet once a month to strategize on how to make their clientele healthier and develop a unified voice for healthy living across the county. If the advisory committee decides diabetes is the issue of the month, for instance, all the owners and barbers across Dane County will share a unified message about diabetes with their clientele. 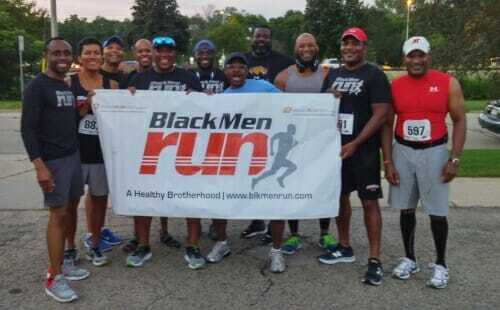 Perry also plans to expand Black Men Run, a running group he started two and a half years ago, into a new group including black boys called Black Men Run, Brown Boys Read. The group will run for the first time next month and afterwards will sit in a park and read chapters from books written by black authors. A group of black men have also agreed to mentor the young boys. “For these young men that don’t have fathers in their lives, we’re hoping that this has a great impact,” Perry said. Perry said the barriers between the black community and the health care system are multi-faceted. Some people mistrust the medical community because of the experiences passed down by their elders. Many men have little awareness or interaction with the system, which can lead to frustration when they try to schedule an appointment and there are no available times that work. Above all, some black people feel that this community doesn’t care about them and their well-being. The challenge is to change that narrative, Perry said, and many fathers have started to accomplish this by bringing their young sons into the center to teach them about their health and how to take care of their bodies. By returning to the template of the early 1900s barbershops, which were social and cultural centers where men could see their doctor, fill prescriptions, and socialize, Perry believes he’s found a model for reducing disparities not just for the black community in Dane County, but for communities nationwide. “I believe we can literally pick this 120 square foot room and put it in any barbershop nationwide and I think it would start to yield the same dividends and would have the same outcomes,” Perry said.